«Я устроилась удобнее, постаравшись не примять цветы, стала наблюдать. тварь вылетела из-за скалы и двинулась в мою сторону; сначала было тихо, но потом высокий отчаянный звук резанул по ушам. Не похоже на нападение. Пройдет ли мимо? Она приблизилась. Она выглядела жуткой и злобной, как всегда. Красные глаза будто остекленели; серебристая, черноузорная броня поблескивала в лунном свете. 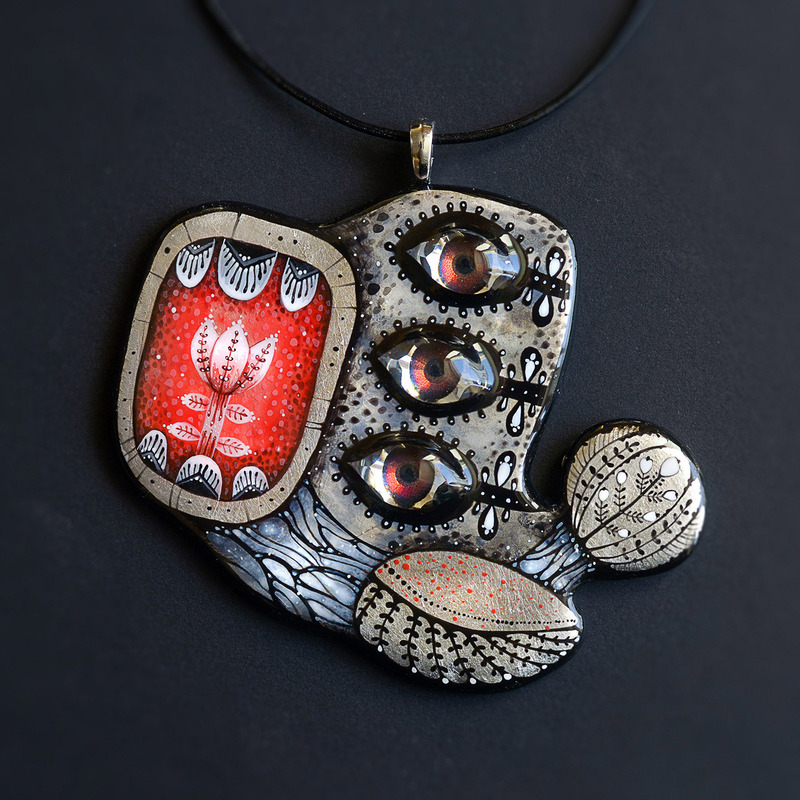 Miniature tempera and acrylic painting on a Ladoll clay pendant with silver leaf coverage. 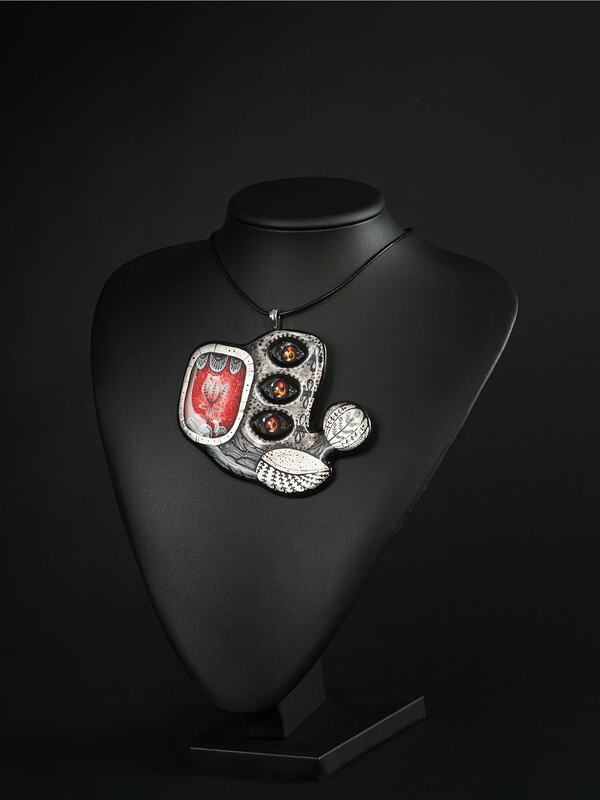 The main elements are three Swarovski ‘Eye Fancy Stone’ crystals. The pendant is 9 x 7,3 cm big. «Trying not to crush the flowers, I made myself comfortable and began watching. The beast took off from behind a crag and was now flying towards me. At first there was silence, but then a high-pitched, desperate sound hit my ears. It didn’t seem to be an attack. Was it going to pass me by? It approached. It looked eerie and vicious, as usual. Its red eyes seemed glazed as if they were made of glass; its silvery, black-patterned armour was gleaming in the moonlight. The beast’s movements were chaotic and twitchy. Why did it have to cross the border of its world? Did it finally go hunting? The beast collapsed onto the blooming meadow like a wounded bird. It wouldn’t last long here: the flowers, our nice, living flowers were a deadly poison to it. I came closer. The scary black-and-silver beast was lying on its side, breathing heavily through its wide opened mouth. Then a beautiful, pinkish white flower fell out from there, and the beast began crumbling into black grains, and then it became dust and it was over. Other, smaller beasts took wing over the rocks, сrying something in their unbearably high, hoarse voices. Кулон из глины Ladoll, покрытый сусальный серебром и расписанный темперой и акрилом. Ключевую роль играют три кристалла Swarovski — Eye Fancy Stone. Размер кулона 9х7,3 см.